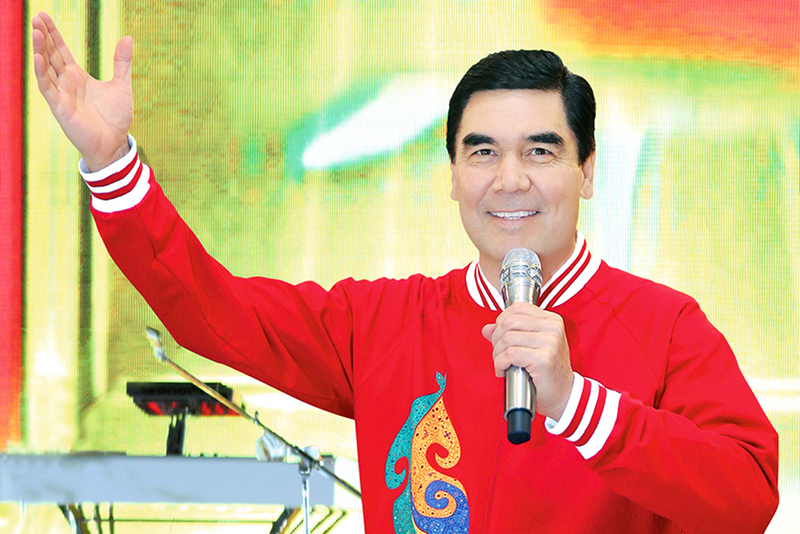 Late one evening in early April, the president of Turkmenistan emerged, dressed in a bright red tracksuit, on a garishly lit stage in the boondoggle Caspian holiday resort of Awaza. As state-run Neutral Turkmenistan newspaper reported on April 10, three days after the concert, that song, titled “Forward, Forward, Only Forward My Beloved Turkmenistan,” is now to be the official anthem for the AIMAG, which will take place over 11 days in Ashgabat in September. If it was not already obvious how strongly the games are being identified with the person of Berdymukhamedov, the April 7 gig hammered the message home. And the investment has been huge. Earlier in the day, Berdymukhamedov reminded an audience in Awaza that Turkmenistan has splashed out an estimated $5 billion on preparations for the obscure competition, which is little known outside Asia – or even in Asia for that matter. That amounts to roughly $1,000 for every man, woman and child in Turkmenistan, where monthly salaries average around $600, according to likely generous figures produced by the World Bank. Ashgabat got the nod to host the AIMAG in 2010, and in December of that year, Turkmenistan’s National Olympic Committee and the Olympic Council of Asia signed an agreement formalizing the decision. Since then, around 40 sporting facilities, including 16 large venues, have gone up in the city. Berdymukhamedov has said he expects around 6,000 athletes from 62 countries to take part in the 21 disciplines represented in the games. Around 30,000 guests are expected to attend the events. “We are making every effort to ensure that the Asian Games are carried out at the highest level,” the president said. By at least one estimate, around 50,000 people were forcibly evicted from their homes to make way for the Olympic-village-style sports venue built for the competition. The games are being operated by London-based events organizer Trivandi Chanzo Ltd, whose experts also, according to their website, were involved in the London 2012 Olympic Games. Trivandi Chanzo-appointed games chief executive Mick Wright last week described the AIMAG as an opportunity to show Turkmenistan off to the world. The choice of date for Berdymukhamedov’s Awaza-related concert was not made casually. April 7 marks international World Health Day – and Berdymukhamedov has made instilling health awareness a core ideological pillar of his rule. Ahead of the concert, the president unveiled a giant $257-million sports complex at the resort. This facility will not be used for the AIMAG games, but instead is to be reserved for guests of the Awaza resort complex, who have, to date, overwhelmingly comprised state workers, although the government has vague plans to boost international tourism. The complex – dubbed by some the “Turkmen Las Vegas” – includes, among many other things, swimming pools, ice rinks for hockey and figure skating, and outdoor fields for tennis, volleyball and mini-football. Such profligacy has taken its toll, especially as the government struggles to cope with the fallout of depressed prices and demand for the country’s natural gas exports. The International Monetary Fund obliquely warned Ashgabat against such costly outlays in a recent statement following a recent mission to Turkmenistan. “Options include gradual but significant cuts in public investment expenditures that remain among the highest in the world, combined with other policy measures which would help adjust domestic demand to a more sustainable level,” the fund said in its March 21 statement. Foreign-based opposition media have reported that the authorities have resorted to making state employees cough up their own cash to pay for the expense of the games in September. One such outlet, Chronicles of Turkmenistan, cited unnamed sources as saying that from April through September, workers in the national oil and gas sector had up to 20 percent of their salaries withheld for the cause. Such has been Berdymukhamedov’s determination to ensure the success of the AIMAG games that he has even taken close personal interest in the design of a mascot. The initial mascot choice was an all-green Alabai sheepdog called Wepaly. An officially produced video made to present Wepaly to the world depicted him as a faithful and dependable sidekick for budding sportsmen. Berdymukhamedov was not impressed, however, and had Wepaly eliminated in favor of a more traditionally cartoonish depiction of a sheepdog. In the final analysis, the games appear primarily intended not so much to celebrate sport as to further burnish the president’s reputation. Indeed, the choice of “Forward, Forward, Only Forward My Beloved Turkmenistan” is indicative of a long-established propensity for seeking to identify epoch-defining events with Berdymukhamedov. The song is not new. In November 2015, in the city of Mary, a crowd of more than 4,000 people assembled in a giant ersatz yurt for a collective sing-along rendition of the tune intended for the record books. Guinness did indeed acknowledge the feat, recognizing it as the “most people singing in a round” at the same time. The singing was led by President Berdymukhamedov. Despite such claims of achievement, the government seems to find itself at the point of diminishing returns when it comes to its sport development policy. Authorities at this stage seem more concerned with avoiding embarrassment than in promoting the value of competition. And so it is questionable whether the games in September will have any meaningful legacy. Turkmenistan remains the only post-Soviet nation never to have won a single medal in any discipline at the Olympic Games. Mindful of that fact, Turkmenistan has successfully lobbied for the inclusion at the AIMAG of sporting disciplines at which it has a better chance of winning. One notable example is Kurash, a relatively obscure form of wrestling most popular in the Turkic world. Such is the president’s reputed dislike for losing in sport that it is said that Turkmenistan’s football federation has routinely avoided hosting qualifying tournaments for regional competitions for fear of losing face on home soil. When local football club league champion Altyn Asyr plays in the AFC Cup – an Asian analogue of Europe’s Champions League – the games are held not at the club’s stadium in Ashgabat but in Balkanabat, a town around 400 kilometers to the west. The games are not always aired on domestic television.